Things were past the point of being serious in our relationship. So when we took a walk around the lake a few blocks from Georgette’s house on that September evening back in 1996, it was no accident that the conversation led where it did. At the time, I was still renting a one bedroom apartment that sat on the edge of Lincoln’s ghetto (so I was informed) where the place smelled like fish oil from the Vietnamese couple down the hall. I wasn’t spending many nights there anymore other than a character-building night every now and then. We both agreed that we had more than enough character building and that at our stage of life, it was way overrated. Not character per say- but the pursuit of more character. “I’m ready to move forward. I know enough to know when I’m ready. What do you need?” she asked. I had a case of the move-in yips. Like a golfer who gets shaky when he tries to hit a big putt, my yips were well earned. I’d moved in and I’d moved out and quite frankly, I liked moving in better. And I never wanted to move out again. Thus, a case of the yips. “Can you say more about that?” OK, I made that part up. Although both of us were employed as counselors at the time, we had agreed to not using counselor-speak on each other. The gist of my concern was that I would be moving into home where she had lived for over 20 years, where she raised her children. A home where there was a place for everything and everything was in its place. Literally and figuratively. I didn’t want my stuff relegated to boxes on a shelf in the basement. No big deal, I just needed some space to call my own. “Well, I’m not very territorial” she said, “and it’s important to me that it be your home as much as it has been mine. I’m not big on wires being strewn everywhere so if you can manage that, we’ll do fine”. And off we went. By the next week I’d given notice on 635 S.20th Apt.2 and we were moving in my stuff. She was true to her word. I’d unload of box of this and that and by the time I got the next box in the door, stuff had already been integrated. I knew there was a reason I loved this woman. I could feel those yips starting to fade away. It was what happened next that really sealed the deal. We were in the basement putting up some boxes of what-not that didn’t need to be integrated when I saw a box of old record albums. Being the music geek that I am, I moved towards them. And then I saw it. At first I thought I was seeing things. This couldn’t be. I mean what are the odds. I’ve never ever known someone who had this album. I was stunned. Way back when I was in 8th grade, I needed some Christmas music for my little record player. 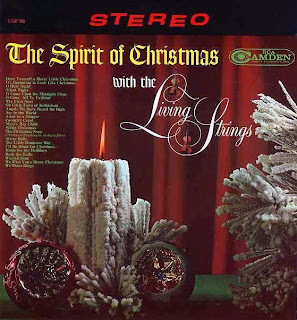 At the local Dahl’s grocery store I discovered an off-label album by the Living Strings titled, “The Spirit of Christmas”. I think I paid $2.25 for it and when I took it home, I fell in love with it. Perhaps one of the finest, yet cheesy, Christmas albums ever produced. Heavy on strings with nice shadings of woodwinds and percussion, this might be what some refer to as elevator music. Some of the songs had a saxophone doubling the lead string line-that was even more reason to love it. I wore that album out and it became my all-time favorite- so much so that it is always the first record I play as the clock strikes 12:01 am on the day after Thanksgiving. Then I play it again and again and again. She wasn’t impressed. Her copy still had the K-mart price tag on it--$2.22 A bargain, I thought. Georgette's copy with K-mart sticker on it. I was beside myself. She still wasn’t impressed. But that’s beside the point. I was the one with the yips. And the cure for the yips was embedded in the sound of a cheesy Christmas album. It was a sign from above, I said . A coincidence? I think not. Our life together for the past 17 years has been proof of that. We are both breaking records (and not the Living Strings record, mind you) every day. 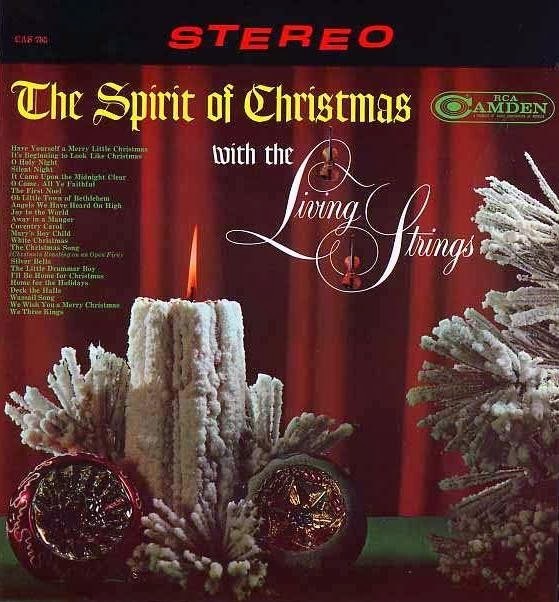 On Thanksgiving evening this year as the clock strikes midnight, all Living Strings fans around the world (all 25 of us) will christen the Christmas season once again with the sounds of side one, track one of the “Spirit of Christmas” and know that all is right in the world. 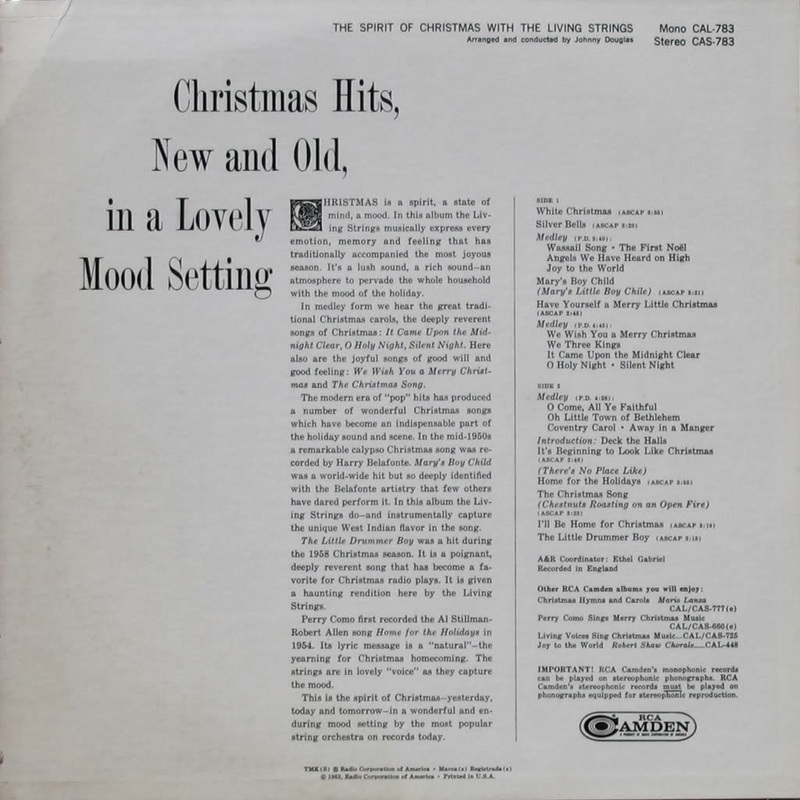 Post script- Over the years I have purchased back-up copies of this album on Ebay and have discovered several other Living String holiday recordings, all recorded in England in the mid-to-late 1960’s. And just a couple of years ago, the estate of the man responsible for the Living Strings released a re-mastered CD of two of the albums, nearly 45 years after their original release. 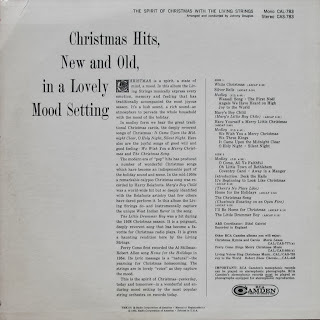 I also discovered a website (http://the-spirit-of-christmas.blogspot.com) dedicated to the Living Strings and the “Spirit of Christmas” album by a fan who proclaims it as the “best Christmas album ever recorded”. But don’t take his word for it- here is a link to You Tube where you can hear the entire album and judge for yourself. That was a sure sign you were meant to be together! Happy listening during this holiday season! I love this post. I can read it time and time again and it still feels like the first time I've encountered this story, even though I heard it in person first. Records connect souls.